Stylish aluminium design - My Passport Ultra Metal Edition brings brains and beauty together. Striking colors and an innovative radial-spin design complement your on-the-go style. Portable storage never looked better. Complete backup solution - WD SmartWare™ Pro backup software offers an easy way to back up and protect your important files. With a variety of backup options; file/folder, category, scheduled and even cloud backup; it fits into anyone’s busy life. Back up your way - Safeguard your memories by choosing automatic and continuous or scheduled backup. Automatic and continuous backup runs quietly in the background and backs up your files every time you add or change and save a file. With scheduled backup, you choose the day, time and frequency of your backups. Cloud backup with Dropbox - Integrate your Dropbox account using WD SmartWare Pro so you can back up your files to the cloud. 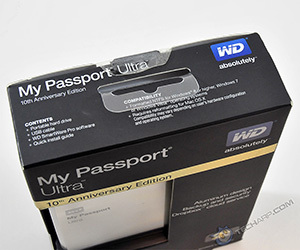 Or, back up the files from your Dropbox account to your My Passport Ultra 10th Anniversary Edition. Save, share, access in the cloud - Do more with My Passport Ultra 10th Anniversary Edition and your Dropbox account. Share and access your files securely online from anywhere, on any device with Dropbox and cloud integration. Keep your private stuff private - Feel secure from unauthorized access with password protection and 256-bit hardware encryption for very photo, video, music and important file you save. Easy setup - Just plug it in and you’re ready to go. Formatted out-of-the-box for your PC so you can quickly start saving your important documents, photos, videos and music. You’re in control - Configure, manage and diagnose your drive with WD Drive Utilities.™ Run drive diagnostics, erase and format your drive, register your drive and more. Ultra-fast USB 3.0 - Transfer files quickly with USB 3.0 powered directly from the USB port on your PC. No separate power supply is needed. WD reliability - WD knows your data is important, so we build our drives to demanding requirements for durability, shock tolerance and long-term reliability. And for peace-of-mind, we back up our reliability with a 3-year limited warranty. 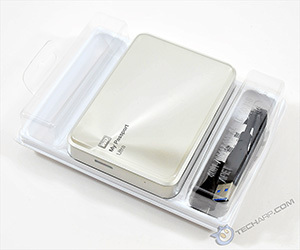 Now, let's find out how this portable hard disk drive fares against its competitors! 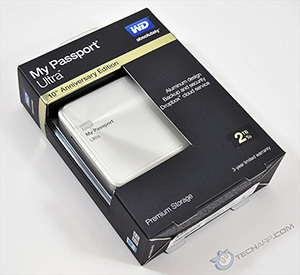 The 2 TB Western Digital My Passport Ultra Metal / Anniversary Edition portable hard disk drive comes in a nice cardboard box with a small clear plastic window in front, so you can quickly identify the colour of the case. 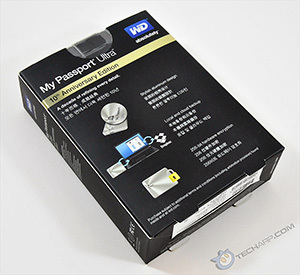 Western Digital currently offers three colour options - Blue-Black, Silver and Gold. The box is actually a generic box, so the drive capacity is identified by the sticker on the lower right corner of the box. The top of the box lists the contents of the box, while the bottom has a white sticker that not only gives you the drive's serial number and place of manufacture (Thailand), it also confirms the drive's warranty period. 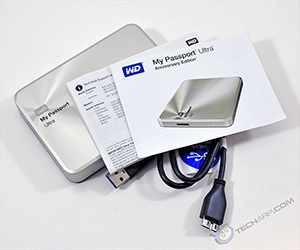 Western Digital is offering a 3 year warranty on this drive worldwide, as well as free 30-day telephone support. WD SmartWare Pro software (preloaded in the drive).